Oh, that's one of my better opening jokes! And eventually, you'll figure out why. Before we go any further though, allow me to say, Friday Rocks! It does! Because it's the last day before the weekend. And no matter how busy you are on the weekend, it's still the weekend! Also, Friday Rocks is the name of my weekly post that just so happens to fall on Fridays. What a co-inky-dink! And Friday Rocks is where I tell you about rocks. Fossils actually. Last week I was telling about how repairing a broken fossil doesn't hurt it's value. I then mentioned about how most fossils people see in museums are 100% fake. And that's ok. I believe I've said before that fossilization is extremely rare. To put it into some perspective, let's look at our closest ancestor, Homo erectus. This was the precursor to us. They lived from about 1.9 million years ago until about 70,000 years ago when we finally showed up. If you took every Homo erectus individual that we can verify actually existed from it's remains, you wouldn't even be able to fill up a school bus. And keep in mind, some of the individuals are known by only a single bone or two. Now consider that dinosaurs lived for 150 million years. And there were a lot more dinosaurs at any given time then there were Homo erectus alive at any given time. While we can't know the exact numbers, it's thought that no more than five million Homo erectus were alive at the same time on the entire planet. There were billions of dinosaurs alive at one time. For millions of years. While it seems like we may have a large number of fossils from dinosaurs, the truth is, only a very small percentage of their remains survive to today. And many of the remains we do have are not complete specimens. Because of the process of taphonomy, (that's the process of fossilization), finding a complete, articulate specimen is incredibly rare. Even finding a complete, unbroken bone is rare. And that's why fake fossils are ok in museums. The actual specimens are far to valuable to put in some display case. Although the value I am referring to here is not their worth in dollars, but their value as research subjects. So when some fossils are found, resin and plaster casts are made of the actual bones. It's these reproductions that populate museums all over the world. The Tyrannosaur you see in a museum in Phoenix may be the exact same one that they have in a museum in Berlin, only posed differently. And the bones that make up the dinosaur you see may have come from several separate individuals. That's why we no longer have the Brontosaurus. Charles Othneil Marsh and Edward Drinker Cope were fierce competitors when it came to discovering and naming new dinosaur species. Marsh found the remains of a juvenile sauropod that he named Apatosaurus ajax. Two years later he found a larger example but it was missing it's skull. So he took a skull that was found in a different location and named it Brontosaurus. It was, however, an adult Apatosaurus. In his rush, he mistook the size differential between the young and old as separate species. Now, just because most dinosaur specimens you see in museums are fake, that doesn't mean all the fossils you see are faked. Things like trilobites, corals, insects, fish, and many many more are actual fossils. Because they were generally smaller creatures, and more abundant, we have more complete examples. And sometimes, we have so many examples of a type of fossil, that they are sliced up and made into jewelry. And that's the type of fossil I'm talking about today. Not every fossil is the actual remains of the creature that once lived. Sometimes all that's left are traces that something was there. We call these Ichnofossils, or Trace Fossils. Things like footprints, or resting places, or poop would be a trace fossil. Yes. I said poop. 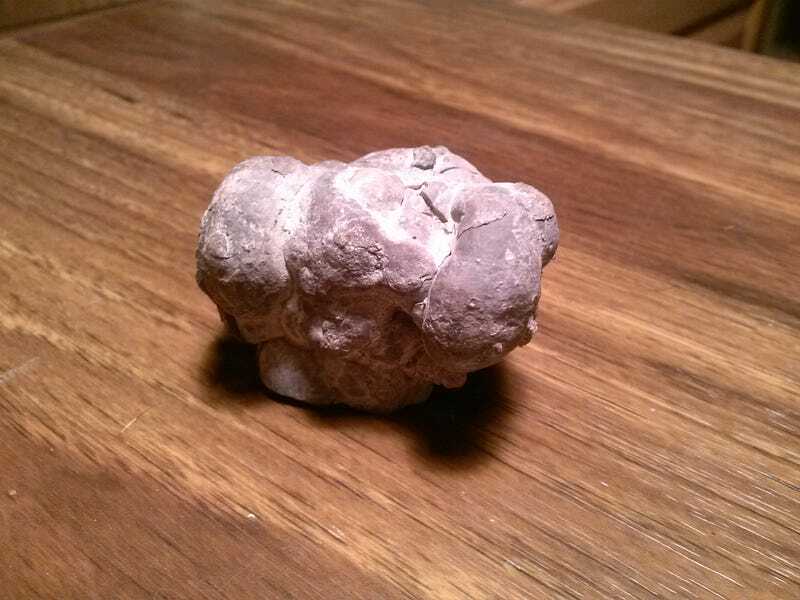 Fossilized poo is called a Coprolite. That's a fossilized poo pictured up there. Yes. I will admit I actually paid for poop. But I don't care what you think. This is the same poop pictured above. It has been sliced in half by someone to see if it would make good jewelry. This one isn't very spectacular, so it was sold to a collector, me. One man, the Reverend William Buckland, even had a table made out of coprolites. I'll own fossilized poop, but I won't make a table out of it. And I won't serve my guests tea on it, either. But Willy was a jerk. He stole the thunder of discovering dinosaurs away from the man who really should have gotten the credit. But that's a tale for another time.